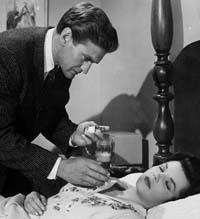 Rod Taylor plays detective Mike Randall in this remake of the 1943 Alfred Hitchcock masterpiece "Shadow of a Doubt." Charles Drake plays Johnny Walters, a psychotic serial killer who returns to his hometown to visit his mother (Josephine Hutchinson) and widowed sister-in-law Helen (Colleen Miller), both of whom know nothing of his criminal activity during his six-year absence. Johnny hopes to settle down and start life anew, but Helen becomes suspicious as Johnny's behavior becomes more threatening and Mike Randall pays a visit to the Walters household. Mike pretends to be a reporter, but Helen finds out later that he's a detective investigating whether Johnny Walters is the man wanted for a string of murders. Mike is called off the case when he's told that the "real killer" was caught and killed on the East Coast. But Helen has discovered he truth, a situation that puts her in grave danger. Failing to talk Helen out of turning him in, Johnny methodically plots her murder. Will Mike -- who has fallen hard for Helen -- show up in the nick of time to save her? "Step Down to Terror" feels more like a TV movie than a feature film. It's moderately suspenseful and Drake is fairly creepy, but it also moves too slowly and generally lacks the moody atmosphere you might expect of this type of story -- evil visits a vulnerable family in an ordinary town. Taylor is solid in his supporting role, but he unfortunately is given little to do.